With the authorities steady ready with their glocks, out drops a magazine bearing two people shooting multi-coloured guns off into the left distance. PISTOL blares large and loud for the eyeballs to line a sight in quick fashion. "Do you like guns?" they ask. "No. It's found reading material. Nothing more." In this case, found several mailboxes away and years from publication and postal delivery. Seven to be imprecise, and holding up well with the ravages of a climate uncontrolled storage area otherwise known as any flat surface inside the domicile. Whatever is the prompt leads a sit down at the library of the public traffic. Snack made of wanting less, needing more and getting a bargain of free that debits in a bit of hurt. Not to mention needing to wash out the ears, just on principle effect of digesting the lifeless words. "lookin' straight at the sun"
Taking the December 2002 sample, the Australian Pistol Shooters' Bulletin was made available sometime between October and November of 2002. Which in the timeline of intra-world events, roughly represents the period in which a destruction of university-level exploits was common ground. It was also a time of Manchester's turn at hosting the Commonwealth Games for the sports inclined almaniacs. Sharp to the touch, the subscriber-only publication from Pistol Australia proudly promotes reader submissions and material to line the borders and gutter fill. Alas, these tend toward the point of view on volunteering at an event which turns out to be better than expected for the time involved. Good times, worth the experience and all that malarkey. Dead to the waters on payback. From this, there's a feeling of collusion in the reader-writers' ranks. Their summations of events starting off and closing out with a sameness of swapping names and events keeping the churn high and the flavour a soft-serve of imitation banana. Interest level in engagement missing the target at 50 metres. The reporting and gistness of news on legislation about gun laws and sports shooting hardens out the rest of the magazine. Taking no joy in the aridness, the mouth sandpapers up from cover to cover. Truly this is the magazine for insiders and those wanting to be really in the know. Exclusionist on a whim, the flanks don't open up wide or welcoming to the casual read. Bring a bottle of water to the shooting range, here's a case of reading to dehydration. 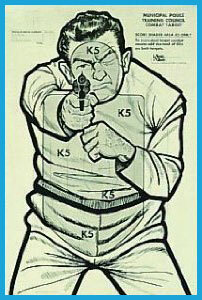 Stare down and pick off some 100 Bad Guy paper targets from Amazon.